Born of Dutch parents at Calvary Hospital, North Adelaide, in August 1956, Gilbert is the second of six children. He graduated from the North Adelaide School of Art in 1980 before travelling to Europe as a freelance illustrator for two and a half years. 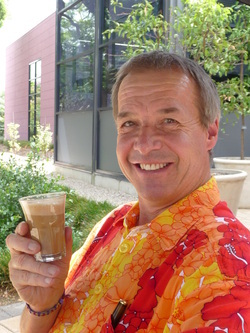 Returning to Adelaide in 1983, he started as the botanical illustrator for the Botanical Gardens of Adelaide and the State Herbarium, illustrating plant material for scientific publications world-wide; a position he held for almost 30 years, leaving in mid 2012. In 1988, a Churchill Fellowship enabled Gilbert to spend 5 months working with botanists and botanical artists in Leiden (the Netherlands) and one month at Kew (England) enhancing his botanical illustration skills and research into Australian botanical artists. In 1990, Gilbert produced the book “Plants of the Adelaide Plains and Hills” in conjunction with John Jessop, which is now in its third edition. During the period 1986-1994, Gilbert taught scientific illustration at TAFE and also gave sessions to botany students at the University of Adelaide. He also visits schools to explain the role and art of botanical artists. He was commissioned to do a number of art works for the Migration Museum during the 1980s, the Maritime Museum in 1998, as well as some schools. Gilbert has also undertaken numerous private commissions including paintings of all types and media, business logos, wine labels and greeting cards. as well as several minor exhibitions interstate. Gilbert’s work has been sought after by a number of collectors and business houses in Australia, Austria, Belgium, Canada, United Kingdom, Germany, Japan, The Netherlands, New Zealand, Scotland, South Africa and the United States of America. In 2000, Gilbert held his first successful solo exhibition during the Adelaide Festival and Fringe titled All in a Day’s Work, at Urrbrae House; consisting of over 100 pieces of both scientific and non scientific work. In 2001, Gilbert made a donation of six hand decorated ceramic platters with botanical themes to raise Monday for the Naracoorte Art Gallery. In 2002, Gilbert spent two weeks at the Art Gallery of SA as resident artist, to draw and talk about botanical art, coinciding with the Captain Matthew Flinders celebrations of Encounter 2002. In 2004-5, Gilbert was commissioned to illustrate and paint Eucalyptus camaldulensis, var cam. (the River Red gum) for the new Federal Court rooms in Victoria Square. In 2005, Gilbert travelled to Guyana to illustrate the giant Water Lily as part of the Adelaide Botanical Gardens 150 year celebrations. In 2006, he completed the Botanic Walk project with the Royal Adelaide Hospital, as well as further wall murals throughout the hospital. In 2010 , Gilbert a similar mural project with Hampstead Rehabilitation Hospital and its patients and clients. He holds workshops at the Art Gallery of SA, and has illustrated a new hard cover publication, “Grasses of SA”. Gilbert has also painted murals for public art, around swimming pools and in homes, and runs botanical illustration workshops regularly for the Adelaide Botanical Gardens. His latest project was a mural with teh students of Unley High School during 2012.